We possess expertise in the manufacturing and exporting of a highly durable range of rubber rollers that is made with optimum quality of polymers. Available with PV coating, these rubber rollers are suitable for steel, hosiery, printing, textile and paper industry. Customized as per the demands of our clients, these rubber rollers are offered in various specifications to choose from. 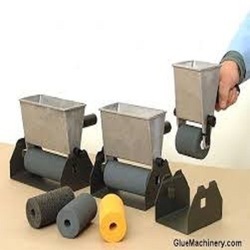 We bring forth for our clients, a dimensionally accurate range of glue spreader rollers that are used for spreading glue on flat our other surfaces. These rollers are made from rubber that is resistant to abrasion and thus provides ease in spreading with high speed. These rollers are provided with different lengths and diameters for different types of work. We are instrumental in offering our clients with printing rollers that are used in printing and publishing sector. 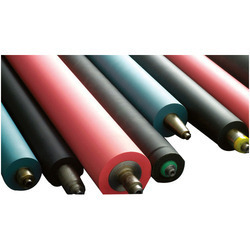 These printing rollers act as rubber blankets in rotary and offset printing processes and are thus available in different cylindrical sizes and diameters. These rollers can also be custom-made to meet the specific requirements of our clients. We have in store for our clients, a sturdy range of rice rollers that are used for crushing rice grains for separating rice and husk. These rice rollers are made from puncture resistant rubber blanket that repels any kind of moisture and thus protects the rice. These rice rollers are available in different sizes and other specifications to meet the specific requirements of our clients. We manufacture highly durable Rubber rollers which are available. These are made with optimum quality of polymers. We offer these rollers to steel, hosiery, printing, textile and paper industry. To make it applicable in different industries we provide it in various specifications.